LOGAN, W.Va. — Richard Ojeda has become one of the stars of the 2018 midterms. First, the national media latched on to this Trump-voting Democrat, and now the national party is behind him too. A recent independent poll found him ahead here in southern West Virginia’s coal-mining 3rd District that President Donald Trump carried by nearly 50 points in 2016. “There was a time when we were laughed at — this time last year — by everyone,” said the campaign’s communications director, Madalin Sammons. It’s people like Sammons, a 25-year-old single mom, who helped get Ojeda this far. Or campaign manager David Graham, who, up until April, was driving a tractor trailer and managing Ojeda’s campaign from the road. Neither Sammons nor Graham nor Ojeda’s finance director — who also happens to be his brother-in-law — had ever worked on a congressional campaign before. Now they’re collaborating with presidential-level consultants who think the race for the open seat vacated by Republican Rep. Evan Jenkins could help Democrats flip the House in November. The Democratic Congressional Campaign Committee recently added Ojeda to its Red to Blue program, which should boost his fundraising. Inside Elections with Nathan L. Gonzales rates his race against GOP state Del. Carol Miller Likely Republican. The significance isn’t lost on Ojeda, a state senator and retired Army major, who made national news when he was physically beaten with brass knuckles days before his state Senate primary in 2016. “You’ve got a guy from a place, an R+23 race, that is basically making people go, ‘This guy can win,’” Ojeda said last week, showing off a local coffee shop called Hot Cup that he thinks symbolizes the potential for revitalization in West Virginia. “And if I can win here, we can win anywhere. We can win in red states,” he said. 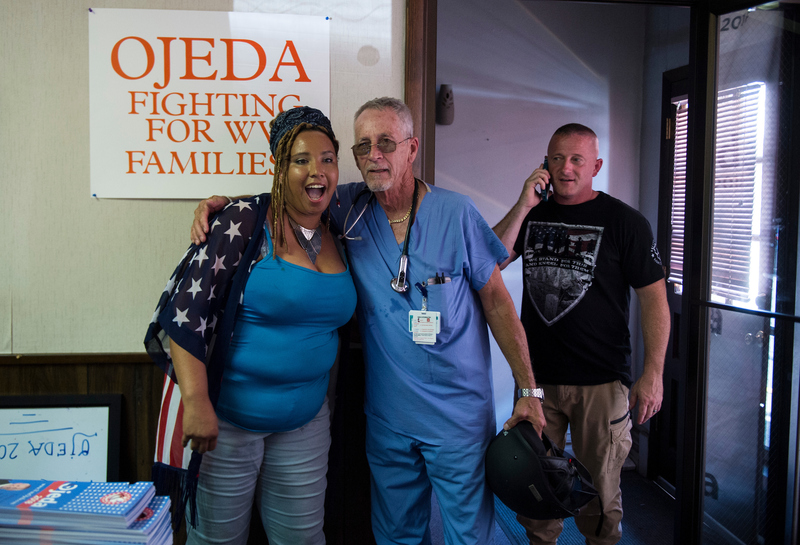 The campaign’s West Virginia roots are a reason national operatives are so enthused about Ojeda’s candidacy in a year when Democrats are desperately trying to reconnect with working-class voters who have moved away from them. Despite its Democratic registration advantage, West Virginia is increasingly a Republican state. “The reality is that if you don’t look and feel West Virginia — and you look and feel anything other than West Virginia — you can’t win,” said Jef Pollock, a veteran Democratic pollster, who was tipped off to Ojeda by the state’s Democratic senator, Joe Manchin III. Krystal Ball’s People’s House Organization was among the first national organizations to get behind Ojeda, and Sammons credits Ball for being an accessible resource to her when trying to get the campaign off the ground. Ojeda knows he puzzles traditional party operatives, and he’s proud of it. “Even the Democrats are looking at me like, ‘Who is this guy? How do we deal with somebody like this guy?’” he said. He hasn’t been afraid to criticize the national party. He talks freely about how out-of-touch and condescending Hillary Clinton’s message about coal and job training was in 2016. He’s been made out to be a Democratic Trump-whisperer — someone who can help explain why working-class voters backed a man who Democrats say wouldn’t seem to have their best interests at heart, and how the party can win them back. Ojeda now describes the Trump presidency as a “train wreck,” but his vote for the president initially gave some of his staff pause. “I’m not going to lie, I went through a period where I was very conflicted about it,” said field director Charkera Ervin, a 32-year-old former teacher. She did a field internship with former President Barack Obama’s campaign, but this is her first job on a congressional campaign. 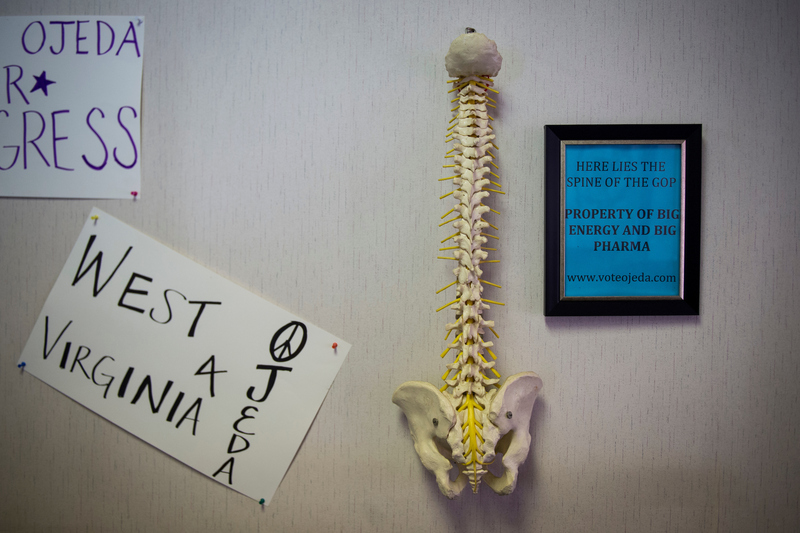 Media profiles have referred to Ojeda as “JFK with Tattoos and a Bench Press” or “A New Kind of West Virginia Democrat,” and by now, he’s used to the attention. Two national reporters and photographers were trailing him in Logan on just one morning last week. “In her cellphone, she’s got CNN, Fox, the LA Times, she’s got the Washington Post — every news agency in America calls her,” Ojeda said, pointing to Sammons, his communications director. “She can pick up her phone and call them, and guess what? They answer. And she’s from Gilbert, West Virginia. Those are the kind of people on my campaign,” he said. Sammons studied marketing and communications at West Virginia University but moved home when she got pregnant. She was working as a local reporter when she sent the campaign a Facebook message about trying to get involved. “I said, ‘I want to remind people of their roots. I want to remind them of why they were Democrats in the first place,’” she recalled. Unlike Ojeda, Sammons did not support Trump in 2016. But she’s the first to admit the national party hasn’t done itself any favors with the way it talks about coal or miners. Half of Sammons’ family works in the coal mines, while the other half is addicted to opioids, she said. Her five-year-old son is autistic, and she noted there are few resources in this part of the state for special needs parents like her. “People in Washington are excited because [Ojeda] can help them turn the House. People here are just excited to elect him because they want a chance at a life,” she said. Graham, the soft-spoken campaign manager, has similar motivations. He got involved in this race because he wants people to have a reason to stay in southern West Virginia. He met Ojeda in 2014 when he was running for the House of Delegates and Ojeda was running a long-shot primary challenge to longtime Democratic Rep. Nick J. Rahall II. Both men lost. Ojeda won his state Senate seat two years later, while Trump was carrying it, and Graham then talked him into running for Congress. The very thing Ojeda is most proud of — having a scrappy campaign — may have initially turned off Washington Democrats who looked at his meager bank account and then looked the other way. “A year ago, they said, ‘Impossible, no way he can win in a R+23 district,’” Ojeda said of the DCCC. He ended 2017 with $11,000 in the bank. Huntington Mayor Steve Williams, who ended the year with nearly $80,000, looked like the natural front-runner. But in January, he dropped out. That left Ojeda as the presumed favorite ahead of the May 8 primary. But his campaign says the national party still wasn’t convinced he had a shot in November. Then his stand with the striking West Virginia teachers raised his profile again. “After the legislative session and the teacher strike, it was like, ‘Oh my God, this could actually happen,’” Ervin said. Ojeda’s team has learned by trial and error, or, as Sammons puts it, throwing “spaghetti at the wall” and seeing what sticks. Only recently has the candidate hooked up with veteran Democratic consultants. In addition to Pollock on polling, he’s working with Joe Hansen for direct mail and Mark Longabaugh for media. New Blue Interactive is handling digital communications. The DCCC started talking to the campaign regularly after the primary. Ojeda’s consultants praise his campaign’s organization, and readily admit he — and his staff — is in the driver’s seat. “They’re much more creative and much more in tune with the voters than the political class is,” Longabaugh said. Miller, the GOP nominee and the daughter of a former Ohio congressman, cuts a very different image of southern West Virginia than Ojeda does. She loaned her campaign $200,000 for the primary and ended the pre-primary reporting period with more cash in the bank. Money has been an issue for Ojeda, with many staffers starting out as volunteers. “The first eight, nine months we worked, we could afford nothing,” Ojeda said. “The first time I told her she could put cheese on her burger, we were like high-fiving each other,” he said, pointing to Sammons. There have been more exciting moments, too. The campaign was in Washington last month when Monmouth University released a poll showing Ojeda ahead of Miller, 43 percent to 41 percent. “I just hit my knees, I was shaking,” Sammons recalled, pulling up photos on her phone of her lying on the floor.